There were 258 lots of medals and militaria in this sale. 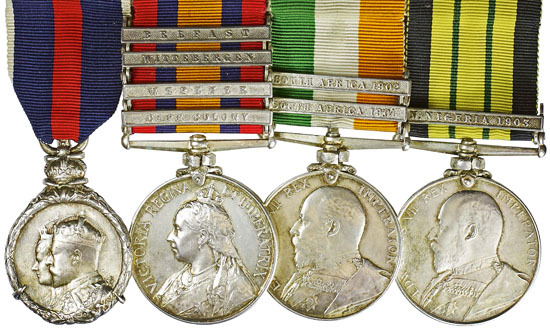 There were a number of highlights in the Victorian section including lot 12, a Military General Service Medal with 6 clasps to James Brown, 5th Regiment. This medal sailed past its estimate selling for £2,183. 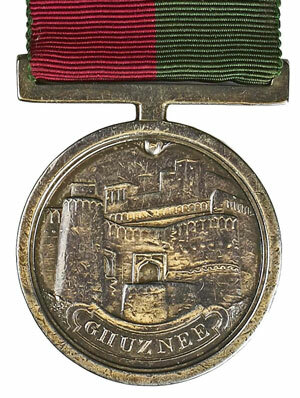 Lot 16 was also well contested and was an 1839 Ghuznee Medal to Paymaster Harry Carew of the 13th Foot. Career details of his having served with 17th Light Dragoons, in a number of campaigns on the sub-continent, helped it sell for £1,357. Lot 69 was a scarce group to Lieutenant Charles Lionel Wells, Northern Nigeria Regiment, who was mentioned in dispatches during a Victoria Cross action in a minor campaign in 1903, in Northern Nigeria. His group of 4 medals sold for £3,304. WW1 was again well represented in the sale with lot 101, a rare 1914-15 Star trio together with 1937 British North Borneo Company GSM, to Lieutenant Frank Reginald Hallowell Carew, selling to a room bidder for £2,832. The highlight of the WW2 section was a 1945 Royal Red Cross 2nd Class group to Major Grace Emmeline Thompson, QARANC, which sold for £1,150. There were 65 lots of militaria and lot 194 was an 1874 Martini-Henry rifle, which sold for £649. Our next medal auction will be held on Wednesday 15th June 2016. Look out for the full catalogue for this sale, which will appear on our website approximately three weeks before the sale. Also keep an eye on our Twitter and Facebook pages which will include updates of our latest auction news.